It leads its visitors into believing that they’ll just be able to sign up, invest some money & begin earning a passive income from the trades the system makes… But does it really work or will the Auto Bitcoin Generator scam you instead? What Exactly Is The Auto Bitcoin Generator System? The websites seem very realistic & appear to be generating the free Bitcoins as promised, however in order for you to get access to the so-called free Bitcoins they then request that you either pay a fee or complete an offer via their website & this is where the scam lies. As you can probably guess the whole thing is just a fake & they’re just making money themselves by getting people to either pay them or complete one of their advertisers offers (who pay them in return). But anyway, it turns out the Auto Bitcoin Generator system isn’t actually a typical free Bitcoin generator scam – it’s actually another type of scam, which is known as a binary options trading scam. So sadly whilst the Auto Bitcoin Generator system makes a lot of seemingly exciting promises, none of them are actually true. In fact instead of helping you make money like it claims it will, the only thing the Auto Bitcoin Generator will actually do is make you lose money instead. How Does The Auto Bitcoin Generator Work? Okay so the concept is that Tom Drepir, the guy who’s allegedly behind the Auto Bitcoin Generator has come up with a “foolproof” algorithm for generating guaranteed profits from cryptocurrency trades. But in order to get access to the software and try it out you’re forced to deposit via Tom’s “recommended” broker – and this is where the scam lurks. You see Tom (or whoever the real creator is behind the whole thing) is actually affiliated with the binary options broker that they recommend you to. This essentially means that when you sign up with the so-called “recommended” broker & make a deposit, the person who created the Auto Bitcoin Generator system gets paid a commission… And guess what happens form there? You’re just led to find out that the whole things actually a big phony. There is no “profitable algorithm” after all, and there is no Tom Drepir either – the whole thing is just a ploy to trick you into depositing with the binary options broker so that the creator can earn a commission. Sadly though the broker is in on the scam too, meaning if you think you’ll just be able to withdraw your funds back out you’ll have to think again. The broker will make it next to impossible for you to get any of your money back… In fact in some instances they’ve even been known to falsify the profits to trick you into depositing even more. Basically it’s bad news! Thankfully if you have already made a deposit prior to this review then there are now companies like MyChargeBack who have had success in helping people get their money back – but the best obvious solution is to simply not make the deposit in the first place if you haven’t done so already. The biggest red-flag is the fact that the creator of the system is affiliated with the binary options broker that they refer you to. 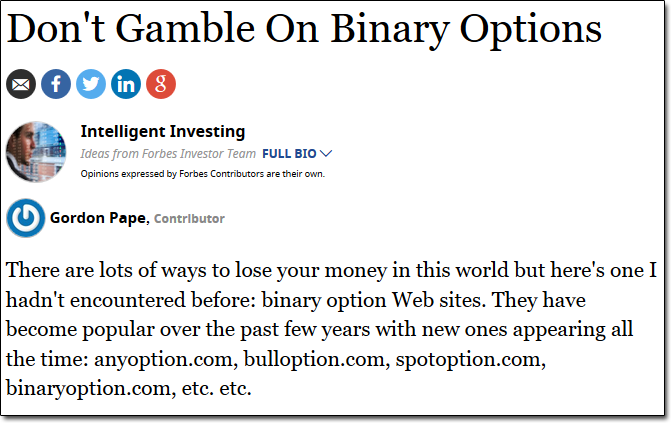 The reason this is a red-flag is because binary options brokers make money when you lose money – they don’t actually earn any money if you make a profit (which is extremely unlikely to happen anyway). So why would a binary options broker pay commissions to the person behind a system that can supposedly enable all of its members to make profits? They wouldn’t! Such a system would put them out of business. 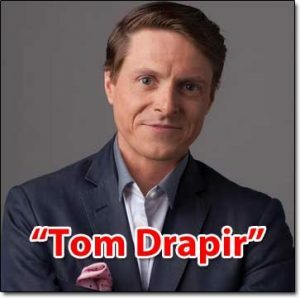 On top of that the guy behind it all, Mr Tom Drepir is a phony. The name is a fake alias that’s being used to hide the real person behind the scam & the photo shown on the website of Tom has been taken from a stock imagery website. Despite that though the website is still targeting visitors from the U.S. so essentially it is operating 100% illegally. Would you trust investing money into a site that’s breaking the law? I hope not! This is done to trick you into thinking that the site has been featured within those publications when in actual fact it hasn’t. A quick Google & site search reveals that – but the people behind the Auto Bitcoin Generator are just hoping that you won’t take the time to run the search. 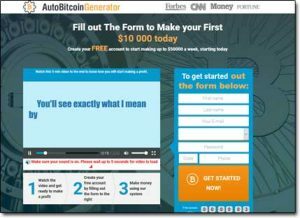 My Verdict – Is The Auto Bitcoin Generator a Scam? I can say with absolute 100% certainty that the Auto Bitcoin Generator is a scam and the reason I can say that so confidently is because I’ve seen this exact same type of binary options scam several times before. Just recently I exposed the Britcoin System scam which works in exactly the same way & so it’s fair to say I have good experience when it comes to these so-called “systems”. The truth is that honestly the internet is great & it provides you with many ways to make money, but it’s not magical & it’s not going to ever see you making lots of money without actually having to do anything like these systems claim. In reality like I mentioned at the start of this review the Auto Bitcoin Generator (and other systems like it) are just set out to part you with your cash to make their creators wealthy at your expense… They’re not really out to help you. Hopefully though my review here has helped you see that & hopefully it’s helped you save your hard earned cash. InstaGC Review – Is Instant Gift Cards A Legit Rewards Site Or Another Scam?